Are you looking for ways and means to make your windows gleaming again? Do you want to know how to skip nuisances like window washing without lifting a finger? You have picked the right company – the specialists of window cleaning in Knightsbridge will deal with this matter in short time. Your windows alongside their framework and sills will look great, we guarantee that! You will no longer need to sacrifice your free time – the results of our work will absolutely satisfy you. Our services merge highest quality with affordable price rates, so don't procrastinate – request an estimate now to save time, energy and money! We also provide our professional services in nearby areas: Belgravia, Mayfair, Paddington, Millbank, North Kensington. We use advanced methods of window cleaning to ensure you will enjoy the great end results. With the water fed pole cleaning system, high pressure cleaning and rope access team, you can rest assured that your property's glass surfaces will be crystal clear. Besides that, your house is in good hands – the cleaners are fully insured and carefully trained. Our water fed extension poles are linked to water supply reservoirs in the vehicles, while our rope access ensures safety – even when we clean high-rise buildings. You can get advantage from these methods immediately – dial 020 3746 3113! We promise that the windows of your business premise will be nice and sparkling, like new. Accomplish that by just booking our commercial window cleaning. For glass surfaces up to the fourth floor, we use water fed extension pole equipment which is absolutely safe and efficient. London is famous for it's tall buildings. So when it comes to those highly-placed windows we will call on our rope access team. With this sophisticated way of cleaning, we can give you end results surpassing any other! You can depend on the cleaners for both private and business window cleaning. Every type of glass surfaces are included in our professional routine. For instance, you can request a service for cleaning small or double windows, French doors, sash windows, bay windows and patio doors. In addition to these, we clean and polish garden window surfaces, conservatories and roof glass. At home or at your workplace, you can always get crystal clear glass surfaces – just contact us! We have what it takes and the right methods for the task. 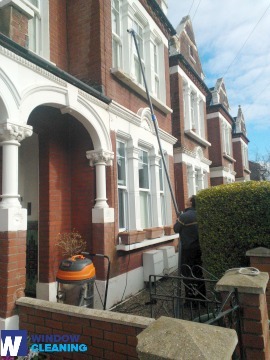 The specialists of window cleaning in Knightsbridge will revive your home. We offer the best window cleaning services in Knightsbridge. Our routine includes water fed extension pole system and also jet washing. We protect your health and safety with non-toxic detergents and purified water. Be one of our satisfied customers – dial 020 3746 3113 and speak with our customer care. You can also order our services online – just fill in our booking form or use our chat feature.